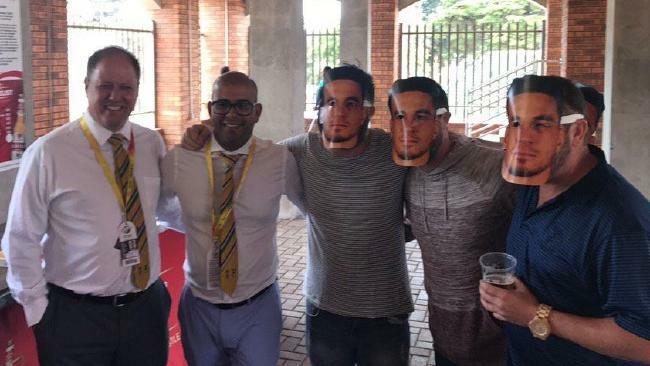 Two Cricket South Africa officials poses with fans wearing Sonny Bill Williams masks. 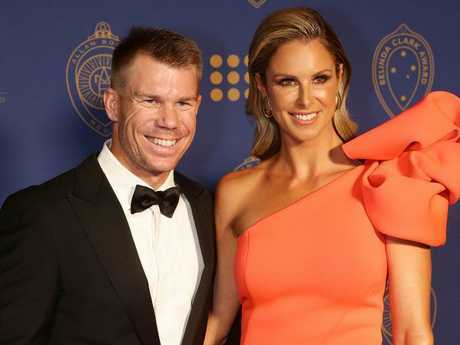 DAVID Warner paid a silent tribute to his family as the spotlight continued to centre on the Australian vice-captain. Disgraced Cricket South African officials could be sacked at an internal disciplinary hearing, but Australia is unlikely to pursue them further over the Sonny Bill Williams mask stunt that was designed to humiliate and anger Warner and his wife Candice. 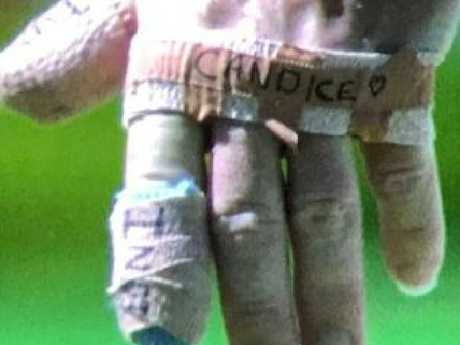 Proud family man Warner wrote Candice across the middle of bandaging on his left hand, and the names of his two daughters, eIvy and India on tape rung around his fingers. David Warner has the names of his two daughters and wife written on his tape. It was an evocative way to express support for his family who have been unfairly targeted by fans and South African officials ever since his stairwell bust-up with Quinton de Kock. Particularly, given Warner also found himself unwittingly in the middle of a storm in a teacup over heavy bandaging on his hand, as tensions continued to mount between the two teams. With cameras focused on Warnerâ€™s left hand at frequent intervals amid insinuations from former South African captain Graeme Smith that the tape was causing consternation between the two teams â€" reprising previous ill feeling around ball tampering question marks â€" the opener made it clear where his focus is. Candice and the coupleâ€™s two daughters are in Port Elizabeth for the Test and will be in South Africa for the duration of the tour as support flooded in from back home following the appalling attempts to shame the former Ironwoman in Port Elizabeth. Cricket Australiaâ€™s board have the jurisdiction to lodge a charge against commercial manager Clive Eksteen and communications manager Altaaf Khaz with the International Cricket Council for bringing the game into disrepute, after the officials posed for distasteful photos with fans wearing Williams masks in a bid to goad the Warners. The ICC code prohibits â€œusing language or a gesture that is seriously obscene, seriously offensive or of a seriously insulting nature to a player, player support personnel, match official or a third person including a spectator.â€? Eksteen and Khaz are technically covered by the code, but itâ€™s understood Cricket Australiaâ€™s board wonâ€™t be imploring the ICC to act, and will instead watch with interest at how Cricket South Africa deal with the appalling incident internally. Cricket Australia Chairman David Peever, who is in Port Elizabeth for the Test, has left his South African counterparts in no doubt about Australiaâ€™s feeling on the matter. James Sutherland has also made strong representations to the same effect. Eksteen and Khaz were ordered back to CSA headquarters in Johannesburg to face the music. 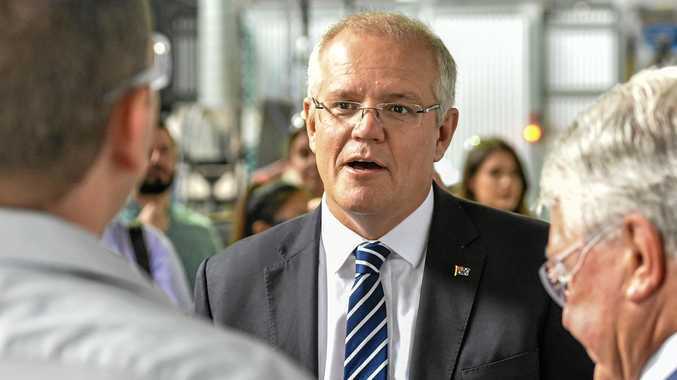 "Cricket Australia spoke to Cricket South Africa officials to express disappointment with this matter and events that unfolded off-field on Friday at St George's Park," said a spokeswoman. "CA appreciates the swift response including the sincere apology from CSA, and the seriousness with which the matter is being treated." Meanwhile, umpires appear to have no issue with the heavy tape on Warner's hand. Warner has a history of broken fingers and most recently damaged his hand in New Zealand. He requires strapping to protect his hand from further deterioration. It's legal for players to wear tape on their fingers unless they bowl. There is history between Warner and de Villiers when it comes to ball tampering - the Australian was fined by the ICC for accusing de Villiers of illegally handling the ball back in 2014.